We are officially inside the 60-day countdown to the start of the 2018 NFL season. Gridiron Thursdays and Sundays are right around the corner. 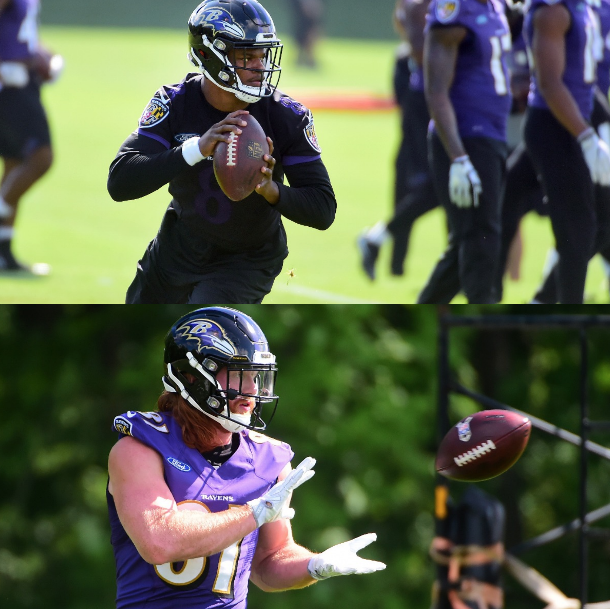 Ravens rookies reported to their first day of training camp on Wednesday in Owings Mills, Md. You might be wondering, ‘Why so damn early?’ Well, the Ravens are scheduled to make their first-ever appearance in next month’s Hall of Fame Game against the Chicago Bears, allowing the team to require players to show up nearly two weeks early. We begin with chatter continuing to build around what Lamar Jackson’s role will serve come September. The No. 32 overall pick has some people in Baltimore buzzing about the versatility his skill set could bring to Marty Mornhinweg’s offense. Jerry Coleman of 105.7 The Fan weighed in. Hayden Hurst is receiving all kinds of love from Madden 19. The No. 25 pick and former standout baseball player is among the top rookies to come out of the SEC, according to the popular video game set to be released next month. Complete Madden 19 NFL player rankings are out. The 24-year-old had all the right things to say about Joe Flacco and Lamar Jackson in his interview with SB Nation’s Baltimore Beatdown. “Both of those guys can throw it where they want it. They’ll put it up even when I’m not open and they trust me to go make a play,” said Hurst. Jordan Lasley is out to prove his doubters wrong. Don’t underestimate the degree of difficulty that comes with doing high-intensity agility exercises…in the sand. Be on the lookout for the 21-year-old former UCLA Bruin in Joe Flacco’s open field. Baltimore Beatdown’s Evan Mazza suggests that the combination of Hayden Hurst and Mark Andrews draws light comparisons to 2010 rookies for the New England Patriots Rob Gronkowski and Aaron Hernandez. “While Baltimore does not have the same offensive pedigree as the Patriots, like Gronkowski and Hernandez, Hurst and Andrews are likely to be targeted significantly as rookies,” said Mazza. This hasn’t received a whole lot of feedback on social media. Get involved by providing your two-cents here. Defensive tackle Michael Pierce gives Twitter a glimpse of his offseason training regiment. RGIII posted a photo of his new hairdo on Instagram. High and tight. This year’s World Cup from Russia has engaged millions of soccer fans across the world. Cue Ravens guard Jermaine Eluemunor and his Twitter takeover Wednesday. I attempted to Mentally prepared myself last night for this England Game today. I can honestly say I’m still not ready but I’m going to push through cause England needs me to tweet at Croatia fans today and tell them how great England is so let’s get it! #ENG ??????? Here we find Jermaine setting the scene, letting his followers know where his loyalty lies. Searching flights mid-match. Never a good idea. High risk, high reward. Judging by his use of exclamation points, the stakes are high. I’m starting to really feel it ?????????????? idc if there’s 80 minutes left ITS OURS ??????? Sharing his feelings early and often. Has to be feeling some type of way, you would imagine. Potential future analyst? Situational soccer knowledge on display. England we are 45 MINUTES AWAY FROM GOING TO THE #WORLDCUP FINAL ?????????????? Confidence is building. Danger zone. You know where this is going. Always an easy target. The people with the whistles. ‘Tf’ stands for ‘Too Far’. Right? Also I didn’t know half these guys on the England squad when i watched the first Group game. Now I’m a huge fan of all of them. Hopefully when I come back to England soon we can kick it since we’re all the same age ? @HKane ??????? Setting up future plans. Smart man. The loss has sunk in. So, now what? Start recruiting. Honestly Watching this England Squad go as far as they did and give it everything they possibly had as a Pro Athlete they’ve inspired me and as a fan of the game they made me Love the Game so much more Thank You England #ENGCRO Love my county. ?????????????? Insightful stuff here. Athletes are human! BUT with all that being said It’s been a goal of mine to bring the Lombardi Trophy back to England, it’s something I really want to do. So #RavenFlock #ThreeLions⁠ ⁠Lets Go ????????? How about this for the ultimate turnaround? He finds a way to spin it back to the ultimate prize: the Lombardi Trophy. Genius. Well done, Jermaine. Your winner of today’s Social Media Rewind. See you soon, Ravens fans. Holler at me here. The power of social media was on FULL display Friday night as UMBC Athletics Multimedia Director Zach Seidel took March Madness to a whole new level. The University of Maryland, Baltimore County’s Twitter account exploded as #16-seeded UMBC defeated #1-seeded Virginia in what could arguably go down as the single-greatest upset in college basketball history. The man behind the tweets? Zach Seidel. Seidel, a 2012 graduate of UMBC, was named the Director of Multimedia Communications/Sports Marketing Digital Media in July, 2014. He primarily oversees video content for the web and social media. Seidel called in to our NBC Sports Washington podcast studios to chat about the last 24 hours. Follow Zach on Twitter (@SeidelUMBC). UMBC faces Kansas State on Sunday at 7:45 PM ET.